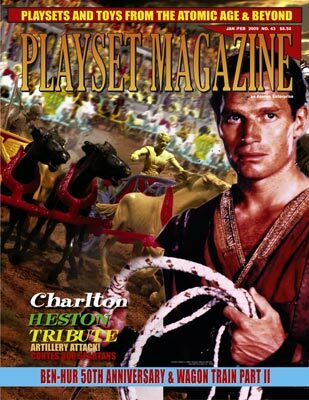 Issue 43: Charlton Heston Tribute! Collectors, as we step through the time portals into Issue 43, it is 1959, not 2009 as you’d expect! PM sort of backs through into the New Year because at Playset Magazine, your fellow collectors, editors and readers all live those times, confident in a happy and prosper. We are pleased to bring you one of the best interviews with Charlton Heston you will ever read, delivered by a source that may surprise some collectors: Jamie Delson. Jamie knew Charlton Heston on a personal basis and made many interviews with him and we are really delighted to make his story a part of ours for this exciting issue. The newly discovered Ben-Hur set in the 2600 range – alluded to last issue is in the 2600 series range – reserved for Marx’ famously difficult to find “Half Set” sets usually marketed in dime stores and Ma and Pa type toy stores although this one was from Mexico and, we think, a contemporary of the larger and much better known American Ben-Hur sets. So give this one a minute or two to peruse – it has bronze-swirled accessories that are just awesome and we bring it to you first, right here in this issue, courtesy its discoverer, LaRue Hermic. Here is a shot of those amazing accessories – and they’re just one part of the full story on page 10 of this issue. 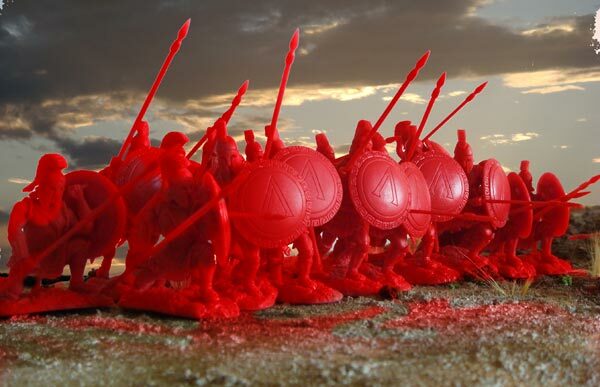 Conte’s “300 Spartans” figures appeared in production quantity and we’re really happy to review them – are they as revolutionary as people have speculated? 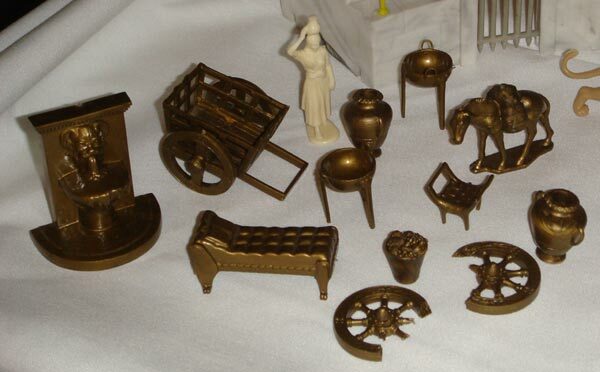 Could any toy soldier actually live up to the pre-release hubbub? Did the figures themselves live up to their prototype debut one full year ago? Find out the answer and more! 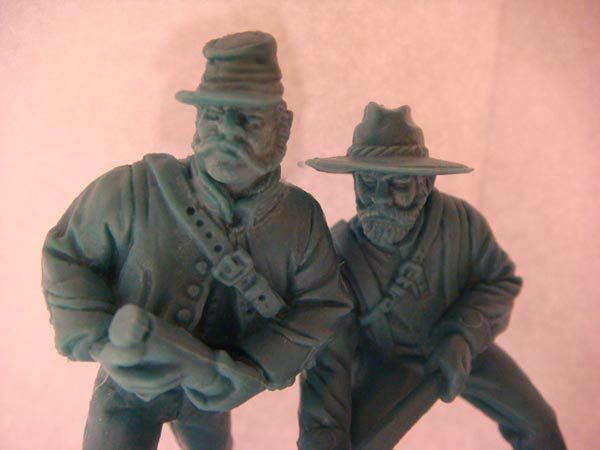 Another maker, Toy Soldiers of San Diegos debuts fabulous sets of “Artillery and Shot and Attacking” Civil War figures – we’re not really sure what you call them except great and action packed and you’ll see them close-up and get the scoop this ish. And of course, Merry Christmas dear readers, and Happy New Year, from Rusty Kathy and Jim, plus all the staff, writers, and contributors that make Playset Magazine everything it is. Folks, if you are still having trouble finding that Christmas gift look no further than Barzso’s Fess Parker Daniel Boone playset. We wanted to show this set in color so here it is. Marching right out the door along with the Daniel Boone set was the licensed "Fess Parker Boonsborough Fort," the stockade once a again the mirror of the TV series. 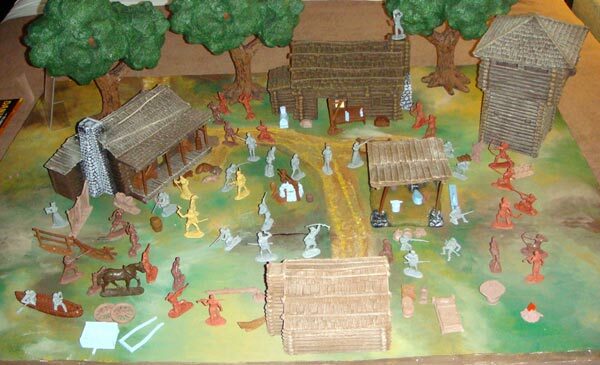 Purchased separately from the "Daniel Boone Boonesborough" playset, it has 4 blockhouses, ramparted walls, a brand new archway with swinging gates and comes in its own colorful carton. Rumour has it a Blockhouse over the Gate version will become available in the future. The walls are beautifully molded without the need for those awkward "over fills" at the bases to stand up, and ramparts are nice and wide and assemble by simply sliding laterally into a slot provided and glueing into place. It sells for $180. For individual figures, both Barzso, TSSD and Conte all have great new sets. You’ll find their web links in our “Links” section if you want direct access. Captain Gallant of the Foreign Legion is our schedule Issue 44. This is a very long-awaited theme that many, many of you have written in about. Now is your chance to dig through your coveted Gallant and Legion items and send in your own piece of history as a story or photos!